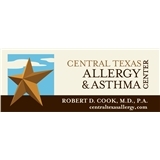 Allergy Partners of Central Texas (Austin) - Book Appointment Online! Dr. Cook and the staff of Central Texas Allergy and Asthma Center are dedicated to providing diagnosis and treatment of allergies and asthma for Austin, Texas and surrounding communities. We treat each patient as a partner and make patient education a central component of their medical care. Dr. Cook gives thorough examination--based on patient written and verbal information, physical patient examination, asking questions, considering any needed test results. Dr. Cook provides diagnoses, provides treatment plan, and answers questions in easily understandable terms--verbal and written. He is supported by an excellent staff. My allergies have greatly improved due to the treatment I've received from him.